Known as ‘The Pearl of the Andaman’, Phuket is Thailand’s largest island and is situated 867km south of Bangkok. 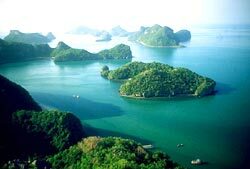 It is surrounded by 32 smaller islands which form the Province of Phuket. It has a long and colourful history and, before tourism arrived, gained much of its prosperity from the tin mining industry. Now Thailand’s most popular tourist destination it offers travellers a variety of activities and sightseeing opportunities. The island has a large number of beaches, the best of which are located on the southern and south west coasts. Further details of some of the more popular beach resorts are provided below. Phuket has a tropical climate with two main seasons, wet and dry (or low and high season). It remains warm all year round with average daytime max temperatures ranging from 85F to 91F (29C to 33C). The dry season lasts from November to April and the wettest months tend to be May, September and October. The weather in Phuket can be unpredictable during the transitional periods between the seasons. The table below gives a monthly breakdown of average temperatures and rainfall. Patong Beach is the largest and liveliest resort on Phuket boasting a 2 km crescent shaped white sandy beach. A variety of water sports are available including jet skis and paragliding for the adventurous or you can relax with a Thai massage in the cooler shade beneath the palm trees that fringe the beach. At night the town comes alive with a huge choice of bars, restaurants and entertainment on offer. There’s also a chance to shop for your souvenirs out of the daytime sun as the vast array of shops and stalls open late every night. Karon Beach is a long sweeping beach backed by sand dunes. This resort has seen a number of new developments in recent years and some of the top hotel chains have resorts in Karon. These are complimented by a good choice of boutiques, restaurants and bars. The nightlife in Karon can be busy in the high season although not quite as lively as neighbouring Patong. Kata Beach lies just south of Karon Beach and boasts a spectacular palm-lined beach, great restaurants, lively but not raucous nightlife which makes it a popular choice with families. A varied choice of accommodation is available as well as a number of shops and boutiques - all close to the beach. Rawai Beach is situated on the south eastern tip of Phuket and is less developed than some of the larger west coast resorts. The beach front restaurants are popular with both residents and tourists, many of whom choose to stop for lunch during a tour around the island. Rawai is the ideal launching point for long tail boat trips to Coral Island, Koh Lone, Racha Island, or Fishing and Snorkelling trips. The beach is also used as a mooring point for the many fishermen who live in the area. Laguna Phuket is one of Asia's largest resort complexes, comprising of 6 luxury hotels, a golf course and residential housing. 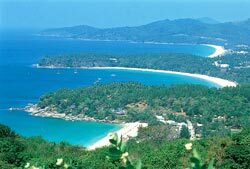 It is situated along Bang Tao Beach on the west coast of Phuket. The complex also has a choice of shops and restaurants. Nai Harn Beach is a quiet spot on the southern coast of Phuket. This tranquil resort has only a few hotels and is perfect for those looking for a relaxing break. A few minutes drive from Nai Harn is the ideal sunset viewpoint called at Cape Prom Thep. Most resorts in Phuket have a large selection of souvenir shops. For the more serious shoppers the Jungceylon complex in Patong Beach is a giant shopping mall with almost 200 shops and a large food court. Phuket Central Festival is a department store and shopping mall on the main road to the airport just outside Phuket Town. Here you’ll find a host of designer names at very reasonable prices. Most towns or resorts have their own markets selling fresh food to the local community. Even if you don’t buy anything these markets are well worth a visit to sample the sights, smells and atmosphere of Thai life that you won’t find in the larger resorts. Thailand's most celebrated festival is the Songkran Festival. It starts April 13 and lasts between 3 and 10 days, depending on where you are in Thailand. The word Songkran is from the Sanskrit meaning the beginning of a new Solar Year. Traditionally people would visit a temple to offer food to the monks or sprinkle water onto Buddha images to cleanse them. These days the younger generations have evolved the celebrations into what amounts to a mass water fight on the streets. You’ll see people using everything from basic containers to the latest design in water guns to soak each other. Tourists are not excluded from the ritual soakings which can provide a light relief in the heat of the high season. Celebrated by Phuket's Chinese community, this festival starts on the first day of the ninth Chinese lunar month (usually in October) and continues for 9 days. Lots of body piercing and strange processions of people under trances. Part of a cleansing ritual which involves many local residents. Excellent vegetarian food on sale in the streets. This loud and colourful carnival offers lots of visual entertainment and fun for visitors. Each year is slightly different, but the festival includes parades, shows and concerts. Bangla Rd at Patong Beach is lit up and turned into a walking street with food stalls, stage shows and other entertainment. The Phuket Carnival marks the start of the official high season in Phuket at the beginning of November. Regarded as one of the most beautiful festivals in Thailand. Small floats made from banana trees with flowers, candles and incense are released into the water at night to take away bad luck. Events are held at all of Phuket's major beaches and in Phuket Town. A truly stunning event. Phuket has something for everyone and is easy to see why it remains Thailand’s premier holiday destination attracting visitors from all over the world year after year.